My dad told me a story once about when he was a boy growing up in Kansas City. One of the neighborhood kids had found out that he was related to Daniel Boone. Of course, at the time, Daniel Boone was a superstar and coonskin caps were a frequent sight in any group of kids. This boy took every opportunity to bring up his famous relative, leaving the other kids wishing that they had a famous ancestor. Fast forward to seven or eight years ago, I found the source of my grandmother’s information: the obituary of my great great grandmother, Abigail Stover (neé Nave), which stated that President Lincoln was her great uncle. Unfortunately, for Lincoln to be anyone’s great uncle, he would have to have a sibling with grandchildren, and President Lincoln did not… his younger brother Thomas died at the age of three, and his older sister, Sarah Grigsby, died while giving birth to her first child, who also did not survive the birth. So, on to the gift: another type of genealogy. The connection here is not blood, but learning. My faculty advisor for my Masters and Doctorate was Dr. Evan Copley, who retired a few years back. He studied at Michigan State University with H. Owen Reed, who studied with, among others, Bohuslav Mårtinu, on whose third piano concerto I wrote my own dissertation. Reed actually studied with several other composers of note, and of course they each studied with other great musicians, and so on. 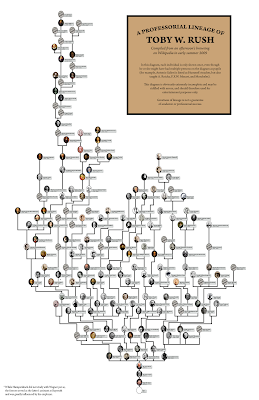 Now, this genealogy comes, quite literally, from an afternoon spent on Wikipedia, which means 1) you can trace my steps if you like, and 2) well, the information is as reliable as anything else on Wikipedia. It is, of course, woefully incomplete; I’ve studied with many other professors, as has Dr. Copley, and so forth and so on. If this type of thing interests you, think of it as a “start.” Most importantly, don’t put much stock in this; it’s not going to mean anything on a resumé, and bringing it up to others will just make you look pretentious. My main point in doing this is to show you that it’s actually a pretty small world, and that the masters we study existed in the same world we do, even to the point of affecting us more directly than we may have previously considered. So I give you my “Professorial Lineage”; and if you’re a student of mine, I commend it to you for further expansion downward. Sofia Dawn Rush, born 14 November 2007 at 6:29 pm via Caesarean section — 8 lbs, 12 oz., and 21 1/4 inches long. I’m home for just a minute to pick up a thing or two and load up these pictures… we’ll be back home from the hospital tomorrow sometime, and I can post more pictures and information. Mother and baby are doing very well!